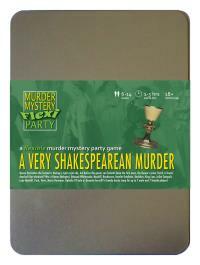 You've been invited to play the role of OPHELIA O'FOOLE in A Very Shakespearean Murder. What scream through yonder window breaks? Queen Derivative the Second is having a right royal ado, but before the guests can forketh down the first oxen, the Queen’s jester Yorick is found dead-ed! Join us to find out who-duneth-it! You were once beautiful but now you’re a hard-working wife and mother. You have dressed for the occasion in a sumptuous purple gown, but your hair is untidy and you have a burping cloth (and a baby) over one shoulder. I’m Ophelia O’Foole, the corpse’s wife. Alas, poor Yorick, I knew him very very well - twice nightly and thrice on Sundays. Of course, that ’twas in the days of our youth when my bosom did swell at the thought of his big staff - he uses one as part of his jestering, it has bells on. Now, he is nothing but a stiff. Oh, how shall I miss him? Let me count the ways… On second thoughts, has anyone seen that staff of his?